The Schluter-TREP-E is designed to protect stair edges that have been tiled by providing an easily visible, slip-resistant wear surface that is meant to create a visually appealing stair-nosing design. This particular stair-nosing is made up of stainless steel which makes it particularly well suited for areas that are subject to heavy foot traffic such as offices and public buildings. The TREP-E is meant to be integrated into stairs that are covered with natural stone, tile, or a surface coating when there is a minimum of 3/32” thick via the perforated anchoring leg. When the perforated anchoring leg is integrated into screed layers, it is very important that the leg of the profile be covered with at least 9/16” of mortar. The Schluter-TREP-EK is a variant of the TREP-E profile for it can be used to cover up any damaged edges on a step without having to replace the entire step. The surface of the TREP-E meets or exceeds the coefficient of friction that is recommended by the ADA for use in applications where the risk of slipping exists. 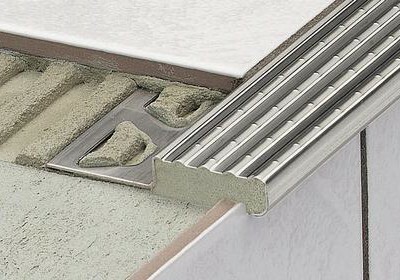 One of the benefits of the Schluter-TREP-E is that there are matching end-caps available for the molding. It is very important when installing the Schluter-TREP-E that you first select the profile needed according to the thickness of the tile. 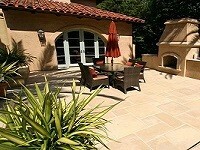 It is also imperative to install the riser flush with the stair tread surface. 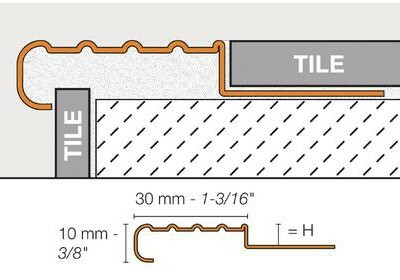 For the full in-depth installation guidelines for the Schluter-TREP-E please visit their website http://www.schluter.com/3_3_trep_e_installation.aspx. The Schluter-TREP-E and the TREP-EK are both made of stainless steel. In certain cases the suitability of the product must be verified based on any anticipated chemic, mechanical or any other stresses. Since the Schluter-TREP-E and TREP-EK are made of roll formed 304 stainless steel, they are well suited for applications that require resistance to certain chemicals and acids. Industries that would benefit from this type of resistant stainless-steel would be the food industry, dairies, commercial kitchens and swimming pools. The Schluter-TREP-E and Schluter-TREP-EK are resistant to both fungi and mold and can be cleaned using common household cleaning agents. If the stainless steel surfaces are exposed to any environmental or aggressive substances, it should be cleaned using a mild or neutral house-hold cleaner. 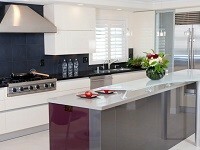 The regular cleaning will uphold the look of the stainless steel while reducing the risk of any corrosion.